A new report from the Transactional Records Access Clearinghouse (TRAC) finds that federal prosecutions for financial institution fraud are -- shockingly -- down year over year, as they have been every year since 1999. 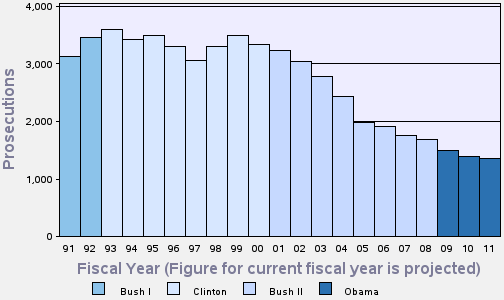 But federal fraud prosecutions still continue to decline. TRAC, a research center at Syracuse University that meticulously collects data about federal law enforcement, staffing and spending, found that during the first 11 months of the 2011 fiscal year, the government reported filing 1,251 new financial institution fraud prosecutions. At that pace, the report found, "the annual total of prosecutions will be 1,365 for this fiscal year, down 28.6 percent from their numbers of just five years ago and less than half the level prevalent a decade ago. " Q. Over the years, the FBI has played a major federal role in white collar crime investigations. Have the FBI's growing responsibilities for investigating terrorism reduced the number of agents available to work on financial institutions fraud matters? Q. Is the FBI's growing emphasis on terrorism and its declining interest on various kinds of white collar crime one of the hidden "costs" of 9/11? Q. Are other agencies -- such as the IRS, SEC, etc -- picking up the slack? Q. When it comes to measuring annual murder trends in the United States, the standard metric has long been the number of the bodies. Though not a perfect metric, it is a quite good way of determining the size of the problem on a year-by-year basis. News stories suggest a growth in financial institutions fraud. What is the value of this anecdotal information? Are there less anecdotal ways to track the trends? Does the steady decline in prosecutions mean that the problem is declining -- or that other forces are at work? America is run by Government Sachs. Jeff Madrick and Frank Partnoy consider the question in the Nov. 10 NY Review of Books. Though they deplore the trend, they attribute the low number of prosecutions to the difficulty of dealing with complex financial crimes and, specifically, the requirement to show that the defendant knew that he was making false statements. But there may be more to it than that. There have been reports that the Obama Administration has, for example, been leaning on Eric Schneiderman, the attorney general of New York, to get in line with other state attorneys general and join a settlement that would give banks broad immunity from further litigation in return for a conspicuously low fine. And a federal judge in New York has been castigating the SEC for settling too low in a notorious case of financial misbehavior. It's worth asking whether the Obama Administration is not following an unstated policy of trying to jolly the banks into good behavior because it fears that criminal prosecutions of bankers would interfere with its efforts to get the economy growing rapidly again. My own view is that the Administration is making the wrong choice. It is always a mistake to decline to prosecute major violations of law.